Brookdale Canton was very nice. They had a physical therapy room. The staff was good. My grandfather is at Brookdale and he LOVES it. Everytime I visit him I am welcomed with a smile. The staff of Brookdale goes above and beyond to make sure all of his needs are met. The activity director is always doing activities that are catered to the residents. I am so happy we decided on Brookdale. Brookdale Canton seemed a little outdated; I just didn’t get a good feeling from it. When I walked in the door, I didn’t see anybody, so I was able to just walk around, which I found a little suspicious that no one even knew I was there. I talked to someone on the phone, and he seemed very knowledgeable and nice, but when I went to the place without an appointment, I never saw any working person. I only saw some of the residents. It was not well kept or up to date. Our experience at Brookdale Canton was not good. My husband is no longer there. He fell down shortly after having gone there, and nobody called to tell me. He was complaining that he was still hurting after three days. I talked to a lady who was kind of the head of the memory care unit. She checked the log book, and there was a entry saying that he had fallen. They did not inform anybody, though. Everything was OK at this facility until there was a virus and they had to quarantine the whole building for two weeks. The staff seemed to be very caring. Do not leave you loved ones in this facility. The care givers are overworked, underpaid and frustrated, The new Brookdale ownership is the largest owner of assisted living facilities in the US. They care about your money, not your loved ones. The quality of care has deteriorated from it's former glory to it's present state of disarray under the new management. Our Mom had been there for a number of years until recently when she has lost weight due to the unappetizing food. Her well kept presents became unkept and unclean. She suffers from Alzheimer's and this facility saw fit to send her to the ER unescorted and did not inform her family until after she had returned. This is not the care that we pay so much for. They are happy to assured you that your family members will be safe and well cared for, it is simply not true. The review guidelines prevent me from saying more. Be forewarned. There are far better facilities. We are sorry to hear that your experience with us is not meeting you and your loved one’s expectations. We appreciate you taking the time to share your concerns and hope you will call us at 877-400-5296 or email us at familyconnection@brookdale.com to discuss your concerns in greater detail. My parents are in Brookdale, and they are fine. They are 100% happy with it. We chose it because it is close, and we can come and see them. I really like it there. It is a nice place. Everyone is very good to them. I don't have any complaints. I will recommend them; as a matter of fact, I already have. They are treated very well there. They are in memory care, and they have excellent care there. We went to the Emeritus at Riverstone, and we really liked this one. The rooms were nice and probably a little bigger than where my mother-in-law is right now. The staff that we met on that evening we went -- the activity director -- was very nice. We met some of the residents and they were very nice, but I think in general we felt like we wanted something just a bit closer to the house. They were having a 70's disco night, so it was pretty active up there. A lot of the residents were out and not in their rooms, so we liked that. The help at Emeritus is phenomenal. I have no complaints whatsoever. At Emeritus at Riverstone, the rooms were larger, and the staff was good. They still call me about once every two to three months just to see how I am doing, and I am impressed with that. I also like the administrator they have. They have bingo and cards. They also have people who come in to entertain. Everything was fine at Emeritus except during the bad freeze. Some pipes froze and the whole place got flooded, so we had to find another place for my wife to live. We weren't unhappy with it. It was fine except that it was going to be a couple of months before they got it repaired and ready to go again. We had checked on several different places, and the main thing was it was close and convenient to where I lived. We were happy with it once we got there. The staff did their job, they were available. The food was fine, too. In fact, I ate there several times and it wasn't bad. Emeritus at Riverstone is a very nice looking place. It's very clean. The staff were fine and I have no problems with them at all during my visit at the facility. My mom is at Emeritus now. They're pretty good. For me, the highlight for this facility is its upkeep and their ability to keep it clean and smelling fresh in all areas of the building. Their rooms are small but they're just okay. My mom seems to be happy there. I would also say that the caregivers at Emeritus have been very good. What they can improve on though is following through on their care plans. The guide was very upbeat and informative. The public spaces were very bright and airy. The rooms are a little small but still adequate. The staff was attentive and friendly. The gardens are beautiful. I visited Emeritus at Riverstone. The whole facility was clean. The people were wonderful. The rooms were clean and they allowed their residents to decorate their rooms. My mom has been a resident of Emeritus for over a year and at first required total assistance, but has continued to improve with loving caretakers. The staff has become like family to her and she has blossomed with this care and can do so much for herself now. Mom loves all the outings and activities that are provided. The food is good and sometimes not so, but any restaurant can be that way. They do offer some choices and sometimes take a bus to local restaurants. Mom takes pride in her new home, loves the garden and fish pond and wants Emeritus to be nice for all the residents. She has a reason to smile everyday and has made new friendships with residents and the staff. I am so happy to see better security in the building and appreciate constant caring staff. I have been very impressed with the staff at Emeritus. They have been so understanding and helpful with my family. I would highly recommend Emeritus at Riverstone. I want to thank each and everyone for everyting they do and have done for my family and me as I know its not easy sometimes. The staff at Emeritus at Riverstone treat my family as their own family and I could not ask for better care! The rooms and entire building are always clean and the entire building feels like a lovely loving home. Macy and staff deserve a 15 rating. They are unbelievably caring, kind, pleasant, professional, and loving to the residents. You can't possibly do better than Macy and her team! The food is mediocre, with the meat selections leaving a lot to be desired. Rooms are above average. The staff is the overwhelming reason my father will continue to live at the Terrace. They are just great. My mother has been at Emeritus for almost a year. I have found that she is treated very well. She is able to keep her independence and her dignity. I think the care from each and every staff member is sincere and loving. I can't imagine her anywhere else. It has been a great experience for my Mom. She has made many friends. The employees have become friends also. They take great care of her. The location of Emeritus was excellent because it was close enough to shopping centers and everything else. However, the living facility itself was not adequate for me. The rooms were too small and I did not like that. The staff were nice and they had all kinds of activities for the residents. They also had meals but I had not tried the food. My mother has been a resident at Riverstone Emeritus now for almost two years. After some "settling in" issues she has come to be very comfortable there and is very happy with the care she receives. For my part, I am most relieved to know she's in a facility where she is looked after daily, gets regular meals, has someone looking after her medications, and lets me know as needed if Mom has had any problems or needs anything. I would (and have) recommended Emeritus to several of my neighbors who are seeking housing for their parents. My Dad has been a resident at Riverstone for over 5 years, initially in the main building and now in memory care. The staff and facilities have been wonderful to work with. Even when there are hiccups (as there always will be), they take care of things and make things right. There are SO MANY employees who care deeply for the residents and grow to consider them family. I'm thankful to those special people. My mother is a resident of the Memory Care unit at Emeritus at Riverstone. We are very thankful for the amazing, caring and competent memory care leadership and staff. They go beyond expectations in their loving care of all the residents. There is ongoing training in the care and support of memory care residents and an overview of this training is also made available to interested family members. Both of my parents are residents at Riverstone and I could not be happier with the quality of the staff and services provided. The convenience and professionalism of the hairdressers and physical therapist has been wonderful and made it a much easier transition for my folks. The management and staff have gone out of their way to make my parents feel welcome and I really appreciate that. My mother is a resident of Emeritus and she loves the place. The facility is so beautiful with its continuously changing decorations and gorgeous gardens.The food is WINDERFUL and the residents even have a menu from which to order each meal. I give the place 6 stars!!!!!!!!! I am glad that my great-uncle is staying at such a fine establishment as the Terrace at Riverstone. We came and visited him a couple of weekends ago, and everything was simply superb at the establishment. The decor was spot on for anyone above the age of 60. The place was completely spotless. The nurses and aids were very friendly and helpful when my great-uncle needed help using the restroom as well. We stayed for dinner and ate with him, and the food was kind of boring, but it was no fault of anybody in the kitchen. The tings that they were given to prepare were prepared for someone with a very bland palette. Afterward, we went and sat outside while we digested, and I felt comfortable leaving him there when we left to go home at the end of the evening. What ongoing training does the staff receive in dementia care? As Brookdale Employees we are required to complete monthly LMS scheduled training sessions. We attend training seminars and have outstanding periodic web training sessions from our corporate office. Describe the overall population of assisted living residents at Brookdale Canton. What is their average age? What are their favorite things to do? *Brookdale Canton’s Average resident is 85. Each resident is different not all the same some like the outings, some like Bingo and Board games, some tend to the garden, some enjoy the social activities like our happy hours, most enjoy the entertainment, some are really involved in the church and weekly devotionals, we even have some residents who like to lead the activities. What programs or activities does Brookdale Canton offer to enrich residents' well-being? We offer a variety of activities Outings such as movies, the tour of homes, trips to the casino, Bingo, Brain games, exercising, walking clubs, gardening, happy hour, different social hours and so much more. What places are near Brookdale Canton or within walking distance for assisted living residents to enjoy? Brookdale Canton is located walking distance to shopping, restaurants, movies and more. .
What transportation services does Brookdale Canton offer to assisted living residents? Brookdale Canton offers scheduled transportations to doctors’ appointments and we have transportation to scheduled outings. What makes the chef or dining program at Brookdale Canton exceptional? What kind of menu can assisted living residents expect? Our resident’s enjoy Home Cooked meals. We offer 3 alternatives for Lunch and Dinner. What safety features or security measures does Brookdale Canton offer to assisted living residents? We have optional pedents for the residents to wear there are also pull cords in the Bedrooms and Bathrooms. How does Brookdale Canton keep residents' families informed about their loved ones? we have a call wheel where we call all residents and family members just to see how things are going at the community and if they have any questions or concerns. We call and speak with the family when we notice any changes and we offer family meetings monthly if the family would like. What is the care staff-to-resident ratio at Brookdale Canton during daytime and nighttime hours? If Brookdale Canton accepts dogs or cats, what indoor/outdoor areas can they enjoy? Yes we welcome cats and dogs up to 40lbs. How many staffers are on duty in the daytime and overnight? What safety features or security measures does Brookdale Canton provide to protect residents who wander? To assist our residents who wander, we have a Secure Neighborhood which is strictly for our Memory Care residents to protect them. It is locked and secured with a coded password to exit. What programs or activities does Brookdale Canton offer to keep residents engaged? How does the staff engage residents' long-term memories? Who assesses residents' health and cognitive functioning? How often is that assessment repeated? An initial assessment is completed before move in and then another is completed in 14 days and then we do one every 30 days. How does Brookdale Canton keep residents' families informed about their loved ones' health? We have a “family wheel” that the managers take and call all our family members monthly. We also offer meetings to discuss care monthly if needed and keep family member informed when there are in changes in their loved ones needs. Describe the neighborhood around Brookdale Canton. Is it located in a residential neighborhood, a business district, a rural setting, or other type of locale? Brookdale Canton is located near shopping and restaurants but it set off the road so when you are in our clare bridge court yard you feel as if there is nothing around. Is Brookdale Canton affiliated with a hospital if more care is needed? We are not affiliated with a hospital or nursing home but we work closely with skilled nursing and hospitals in the area and we can help point you in the right direction. Activities Extra: Welcome Home! Brookdale Canton's Warm And Friendly Environment Is Felt The Moment You Walk Through The Doors. Our Grand Family Room Is A Great Place To Relax By The Fire, Read A Favorite Book, Enjoy Piano Entertainment, Socialize, Make New Friends Or Simply Do As You Like. It's Your Home! All On One Level For Easy Access, Our Community Consists Of 65 Senior Living Apartments. Spacious Studio, One Bedroom And Two Bedroom Apartments Are Available. 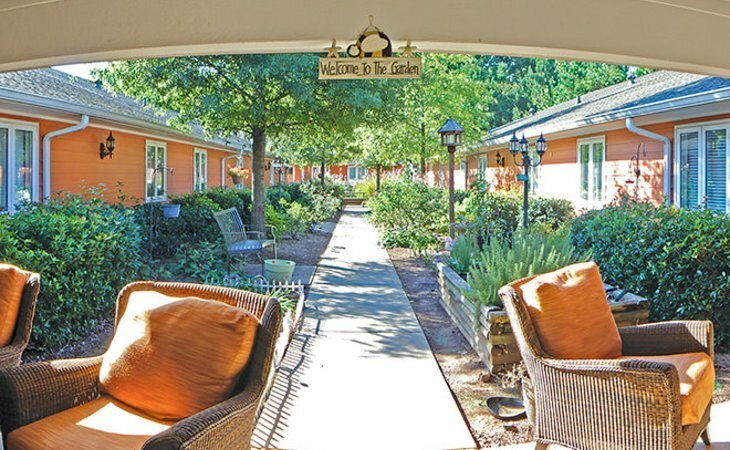 Our Alzheimer's And Memory Care Secured Community Consists Of 28 Studio Apartments. We Encourage All Our Residents To Personalize Their Room To Their Individual Style. Our Community Common Areas Feature Covered Patios And Gardens, A Lovely Dining Room, Reading And Game Areas, Tv Room, Activities And Wellness Center. Located In The Foothills Of The Blue Ridge Mountains, Brookdale Canton Is Set In A Picturesque Area Of Canton. Northwest Georgia's Colorful Seasons Will Delight The Visual Senses While The Convenience To Hospitals, Doctor Offices, Shopping, Restaurants, Movie Theatre, And Parks Promote Wellness And Peace Of Mind To Our Residents And Their Families. What should caregivers and potential residents know about Brookdale Canton?